I believe that no matter where you go you need to know where to find a decent bookstore. Latin America boasts its big bookstore chain, El Ateneo, but the stores are usually too big, stifling and not rich in hidden gems. 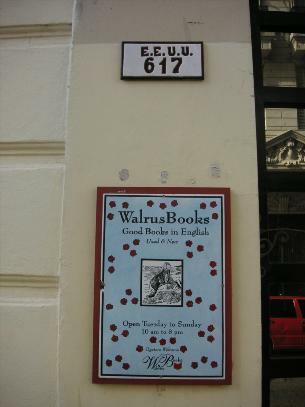 Just recently I stumbled upon Walrus Books in the barrio that I live in, San Telmo, Buenos Aires. The bookstore is non-descript, but when you go in, you feel like you are walking into your own study. Floor-to-ceiling shelves filled with new and used books, mostly used. The genres range from classic literature to psychology to political philosophy to, yes, travel books. Although I think that the basic travel book is essential, it is always nice to add those books that carry a subjective experience with them. Yesterday, I bought Bruce Chatwin´s In Patagonia, a recount of his time in the Southern Argentine province. It was a used copy, which means affordable. I chatted with Geoffrey, who owns and runs the bookstore with his wife. He explained that it was difficult to find inexpensive books in Argentina so he and his wife chose to sell used books, although an occasional new copy will pop up. They started their business 6 years ago: the first 3 years in the barrio Palermo and the latter 3 years right here in San Telmo. Even though SanTelmo is considered the most touristy barrio, Geoffrey says they don’t get much pedestrian traffic. Well, I am excited to have found it. So, if you need a book about Argentina, other people´s experiences in Argentina, or if you want a book for the plane, check it out. Cozy, friendly, helpful and riddled with hidden gems. Everything that makes a great bookstore.